Join us for Remixing Catalhoyuk Day, a public program sponsored by OKAPI and the Berkeley Archaeologists at Catalhoyuk. Visit OKAPI Island in the 3-D virtual environment of Second Life and explore the past and present of Catalhoyuk, a 9000-year-old village located in present-day Turkey. OKAPI Island features virtual reconstructions of the excavation site and multimedia exhibits of research data. HERE are a few slides showing just a tiny sample of what is offered on the island. Join us for Remixing Catalhoyuk Day, a public program sponsored by OKAPI and the Berkeley Archaeologists at Catalhoyuk. 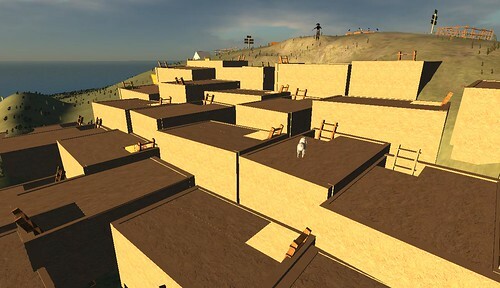 Visit OKAPI Island in the 3-D virtual environment of Second Life and explore the past and present of Catalhoyuk, a 9000-year-old village located in present-day Turkey. OKAPI Island features virtual reconstructions of the excavation site and multimedia exhibits of research data. The Island was constructed by a team of undegraduate research apprentices during the Spring and Fall 2007 semester. The Remixing Catalhoyuk program includes lectures, guided tours, games, and much more. Mark your calendars! Guided Tours of OKAPI Island. Tours will be conducted by Ruth Tringham (Professor of Anthropology, UC Berkeley, and Principal Investigator of Berkeley Archaeologists at Çatalhöyük) and the Remixing Çatalhöyük team. Lecture: “Cultural Heritage Interpretive Videowalks: Moving Through Present Past Places Physically and Virtually” Presented by Ruth Tringham to the UC Berkeley Landscape Architecture and Environmental Planning Colloquium and simulcast in Second Life. Turkish Music Mix. Visit OKAPI Island, learn about Çatalhöyük and build your own remixes in the OKAPI Island Sandbox while listening to DJ (and UCB Anthro grad) Burcu’s eclectic mix of classical and contemporary Turkish music. Remixing Çatalhöyük Video Festival. Nine video producers will share videos about Çatalhöyük. The Video Festival will be hosted by VJ (and UCB Anthro grad) Colleen Morgan. Remix Competition. The public is invited to use the OKAPI Island Sandbox or Graffiti Cube to build and share reconstructions of Catalhoyuk or “remixes” of archaeological research data. At 5pm PST, the Berkeley Archaeologists at Catalhoyuk team will review and select top entries for virtual awards and exhibition on OKAPI Island.